With the first trailer for Suicide Squad being leaked out of Comic Con, it’s hard not to get excited about David Ayer’s entry into the DC cinematic realm. 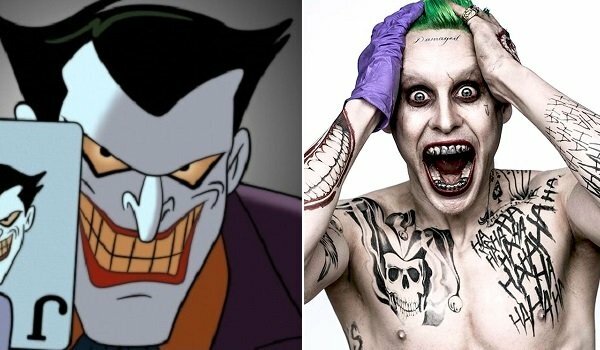 One aspect in particular that had audiences pleasantly surprised is the first official appearance of Jared Leto’s incarnation of The Joker. While we’ve seen set photos, and even that "promotional photo" that showed off the Joker’s new tattoos, we haven’t seen the man himself in action until now. With the official trailer released in glorious HD, we’ve gotten a nice and up-close look at Leto’s version of The Joker, as well as the rest of the team, and we’re intrigued. One of the reasons we’re so pleased with what we’ve seen is the fact that David Ayer’s Joker is familiar to die hard fans, yet different enough that everyone has something new to look forward to. 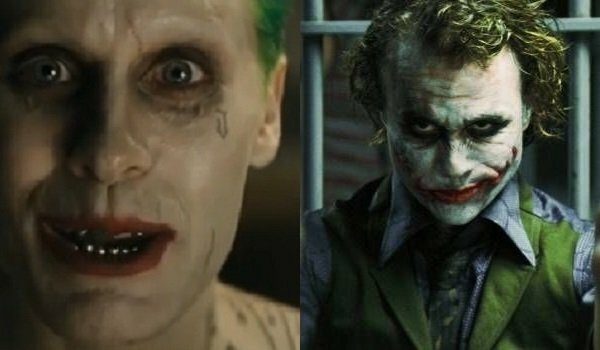 With that in mind, join us as we take a look at Jared Leto’s Joker as he compares to the Jokers of the past. If there was any one influence that could be singled out for Jared Leto's vocal performance as The Joker, it would have to be Heath Ledger. While Cesar Romero and Mark Hamill took lighter pitched approaches to the clown prince of crime’s dialogue, Jack Nicholson started the trend of adding a more psychotic tinge to Joker’s one liners. While Nicholson still camped it up to a certain degree, he made the Joker a man to be reckoned with, and that’s something that even Hamill’s interpretation would build off of. Of course, Ledger was the first to get truly disturbed with his voice, and Leto seems to follow a similar pattern of speech and cadence. The big difference in Jared Leto’s vocals though is that his laugh is more deliberate and drawn out. If anything, it almost sounds like a laugh being pushed through a sensation of physical pain, as opposed to the giddy or manic laughs his predecessors have displayed. The Joker in Suicide Squad is more of a fashion plate than any other portrayal. With Cesar Romero, all the way through to Jack Nicholson and Mark Hamill, The Joker has been a man of more gawdy tastes. Think of a tuxedo by way of a circus sideshow, and you’ve got The Joker’s usual flare for the theatrical. Heath Ledger, on the other hand, had a slicker look once he robbed the mob of their money - opting for a three piece suit that still flashed with The Joker’s signature mindset, but bringing him closer to reality in the process. Jared Leto’s costume, from the snips we’ve seen in set photos, is definitely more of an ensemble of modern glitz. With a shiny suit and a nice red shirt, this Joker isn’t standing on ceremony. The absence of a necktie only further accentuates this nightclub-ready Joker. Not to mention, his Joker is so jacked we’re going to see him shirtless in Suicide Squad, making Leto the first Beefcake Joker we’ve ever laid eyes on. Much like the costumes worn by the various Jokers in DC’s cinematic history, the hair is an integral piece that’s developed over the ages with the character. Cesar Romero and Jack Nicholson really didn’t alter their hairstyles all that much for their incarnations of the role, except for the coloring. Both gentlemen had a light green that could stand out, but didn’t pop too much when set against anything other than the pale face of The Joker. Even Heath Ledger’s hair wasn’t particularly eye popping, but it was still noticeable as his incarnation for stringy, unwashed hair with an imperfect dye job. Jared Leto’s Joker stands out like a neon sign that says, "Look at me!" Not only is his hair a bright, eye-catching green that you’d have seen on Nickelodeon in the 1990’s, but it’s also trimmed and extremely neat. Combined with the costuming choices they’ve made for his character, we can’t help but notice that Zack Snyder must have had some influence on the project, as this Joker reminds us of the one Frank Miller gave us in The Dark Knight Returns. In other words, the nice suit and the well-coiffed hair are mere distractions from the insanity that lies within. 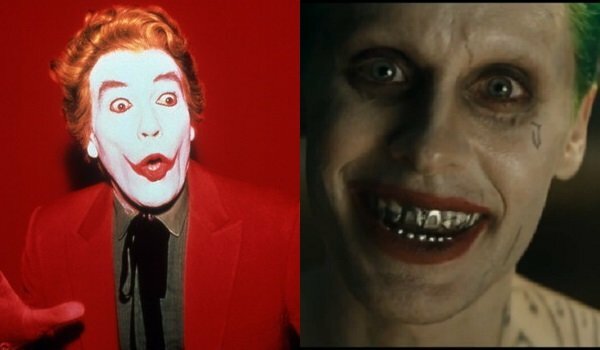 Of course, when we talk about The Joker, the one thing we can never forget to discuss is the makeup. It’s a factor so key to the character’s background that you can tell what type of maniac the filmmakers are going for when you take a closer look. Heath Ledger has, of course, become iconic in his own right for the Nolan trilogy’s usage of a Joker whose makeup is as sloppy as his emotional state. But the character had always been a sort of traditionalist through the Romero/Nicholson/Hamill era. The only real deviation was the face that was wearing it. Yet here comes Jared Leto’s Joker, with a look that both stands out and blends in. It stands out because the shades he uses do stand out when lit correctly. His red lips in particular stand out among the tattoos and the eye makeup he employs in his appearance. The big difference though is the white foundation the character has been known to use. 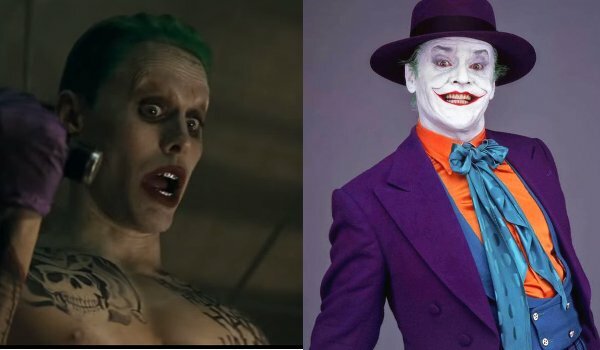 In Suicide Squad, it doesn’t look like he depends on it all that much, as the glimpses we get of him in the trailer make him look more naturally pale than any other Joker out there. He may have less makeup, but that just makes his natural pallor all the freakier to look at.